Our geotechnical engineers tailor exploration programs for each project to understand the conditions and complete the site characterization necessary for site improvement. S.W.COLE tailors subsurface exploration programs for each specific site to investigate soil, bedrock and groundwater conditions necessary for design and construction of site improvements and building foundations. 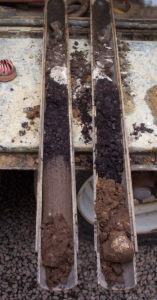 Our examination of a site’s soil and rock parameters allow us to make recommendations on excavation, dewatering, compaction, soil re-use and drainage based upon the site characterization. Our engineers work to help you and your team gain knowledge of the subsurface conditions at your site to help make your project a success. And, because we work with our own exploration company, S. W. Cole Explorations, LLC, we can service your project efficiently in-house.